Rudy’s Lakeside is located 1/4 mile West of S.U.N.Y. 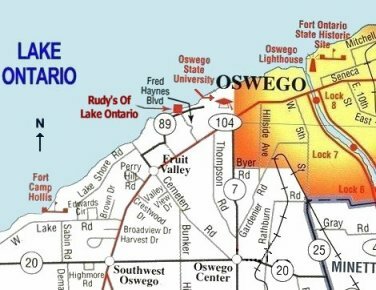 Oswego and the city of Oswego. We are on County Route 89 at the intersection of Fred Haynes Blvd. From Oswego: Take St. Rt. 104W (west) past SUNY Oswego to Fred Haynes Blvd. Turn right and follow to the end. You will either end up in our parking lot, or the lake!